A lot of concept houses come across our desk here at Inhabitat, but we were really impressed with this design for eco-housing in Ghana. Designed by Lisbon-based Blaanc in collaboration with Architect João Caeiro, Emerging Ghana is a plan for an eco-affordable single family house for the emerging middle class of Ghana. The design recently won first place in the international design competition Open Source House, a non-profit organization that aims to provide better, more sustainable housing in low-income countries. 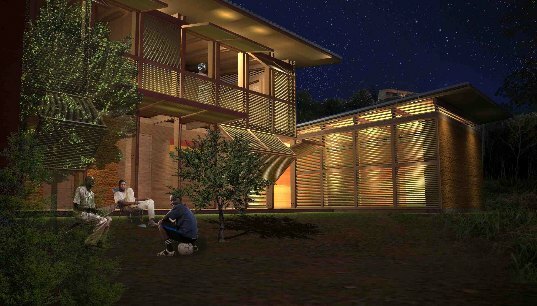 Emerging Ghana is modular single-family home design to be built with local materials, local labor, and with all the best sustainable design strategies you can imagine, all for a low cost of about $12,500 USD. 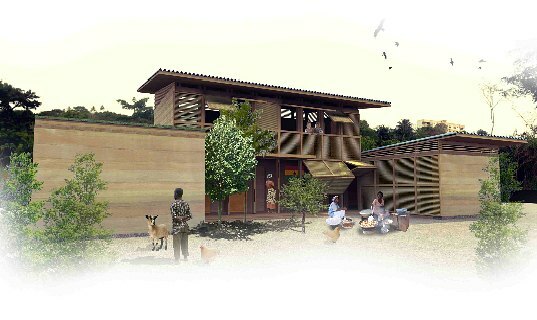 The Open Source House competition challenged architects to design an affordable, flexible and sustainable house that will be made available to people living in poor housing conditions. Blaanc and João Caeiro responded with their completely practical and well-considered concept for a single-family home based on the Ashanti compound, a courtyard building with a deep structure and large overhangs that encourage natural ventilation. Modular by nature, the home can grow as funds allow and as the family expands. Construction materials are all locally sourced – rammed earth walls, dahoma wood, and bamboo can all be found nearby to construct the home. Meanwhile, local people would be taught how to build the homes, giving them a new skill set and boosting the economy. Energy efficiency was a primary design goal to improve the home’s overall sustainability, but more importantly to create a more comfortable living environment with minimal costs. Low-tech energy solutions would be capitalized on to minimize energy use and maximize comfort. Solar passive design with a south-facing structure and large overhangs provides shade for the interior. A solar hot water tank on the large roof provides hot water for the kitchen and bathroom. Orientation of the home improves natural ventilation, while rain water is collected for use within the home and for the garden in the courtyard, which helps provide some of the family’s food. A small scale septic tank manages the household’s waste, while organic waste is composted in the yard. The concept will be built sometime in 2010. Beautiful design! Will make a lot of difference in Africa. Any links to the architect who designed this? How soon will the project take off? very nice.....what program was used for the 3d model? This is a extraordinary concept home. Its eco-friendly design needs to be promoted and marketed throughout Africa and the so-called developing world.